Once the euphoria over Aung San Suu Kyi's apparent victory in Myanmar elections subsides, her opposition party will face a variety of hurdles and complications in its struggle to bring more democracy to the long-repressed country. Even if Suu Kyi's party wins by a landslide, she cannot become president. The Nobel laureate's longtime popularity was so feared by the former military junta, which ceded power in 2011, that it included a clause in the 2008 constitution to limit her political power. It states that anyone who is married to a foreign citizen or whose children are foreigners cannot be president. It is seen as custom-made for Suu Kyi, whose late husband and two sons are British. In interviews before Sunday's election, Suu Kyi said if her party won, she would run the government and be "above the president" — a statement meant to encourage voters but which raised eyebrows among analysts who wondered what she meant. Suu Kyi has not explained or said whom she would nominate as president. If her National League for Democracy does win enough seats to form a government, there is also the challenge of how to lead it. Nobody in her party has any experience running a government. No matter who wins the election, the military will still wield enormous influence within the government. Under the constitution, 25 percent of the seats in Parliament are reserved for the military. That means to have a simple majority, Suu Kyi's opposition party must win two-thirds of the vote. It also means that any government she leads would be hamstrung by the military's continued role in politics and power. Amendments to the constitution require more than a 75 percent vote. The military also retains control over three crucial ministries that oversee the police, army, border affairs and a vast bureaucracy across the country. The military has special emergency powers written into the constitution that give it the right to take control of the country for vague and unspecified reasons of "national security" and "national unity." Last month, the government signed a cease-fire agreement with many of Myanmar's ethnic minority guerrilla groups. The pact nominally put an end to decades of armed conflict, but major groups with the heaviest firepower stayed away from the accord. Also, many cease-fires have come and gone over decades of ethnic insurgencies, and like them, the latest makes no concession to the bedrock demands of the ethnic groups for greater autonomy. Not included among the cease-fire groups are the Kachin, whose fight against the government has been the fiercest in recent years. They believe there can be no lasting settlement of ethnic complaints under a government dominated by the military. The military, in turn, claims an aggressive counterinsurgency is crucial to maintaining national unity. Suu Kyi has been criticized by many former admirers overseas for failing to defend Muslim rights and for her silence on the plight of the Rohingya, Myanmar's persecuted Muslim minority. She has defended her reaction as a means of political survival in the mostly Buddhist country, saying her job is to reconcile the two communities, not to fan divisions. In a pre-election news conference, she urged reporters not to "exaggerate" the Rohingya's problems in a country with many problems to solve. 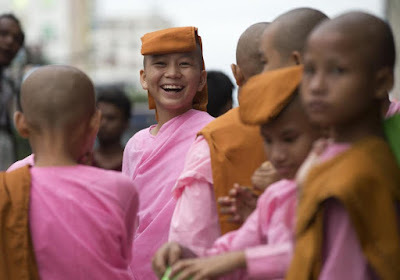 The London-based Burma Campaign UK said in a pre-election report that the National League for Democracy "has appeared to pander to prejudice against Muslims rather than challenge it, leaving many Muslims without much hope that the NLD will do much to stop growing anti-Muslim activities" or repeal recently enacted anti-Muslim laws. Another rights group, the Washington-based United to End Genocide, said in a statement Tuesday that the "poisoned atmosphere" against Muslims in general and the Rohingya in particular could lead to violence that would give the military a pretext for stepping in to protect the peace. For the first time, about 500,000 normally eligible voters from the country's 1.3 million-strong Rohingya minority were barred from casting ballots. The government considers them foreigners even though the families of many have lived in Myanmar for generations. Neither the opposition party nor the military-backed ruling party fielded any Muslim candidates.